Patients generally receive laser treatments during the Fall or Winter seasons in order to avoid the sun. Now, the Infini laser provides patients with the luxury of receiving nonsurgical facelifts all year round. 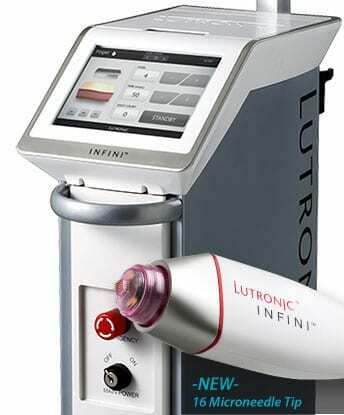 Other lasers can’t effectively treat darker skin pigmentation, whereas the Infini device is safe for all skin types. The Infini laser reverses the aging process by removing wrinkles and lifting/tightening the skin. What is the Infini Laser? The Infini is a microneedling, fractional radiofrequency device that targets coagulation zones within specific layers of the dermis. The Infini is a high intensity laser that adds heat only at the distil tip. Dr. Wald can manipulate the laser by specifically adjusting the needles depth to match the desire of each individual patient. Within three days to one week Post-Treatment patients notice a brighter skin tone and significant reduction in oily secretion, for those with oily skin types. One month after treatment patients see improvement of fine wrinkles and skin laxity. There is continuous improvement of fine wrinkles, pore sizes, scars, and skin laxity up to three months after treatment. 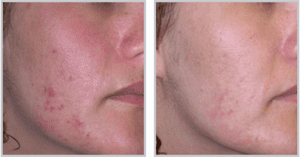 The Infini laser removes wrinkles, sagging, acne scars, and reverses the aging process. The technology of the laser provides maximum comfort with little downtime. Holes from the treatment will be completely closed within just two hours after treatment. Some patients may experience some bruising, but makeup can be applied the following day. 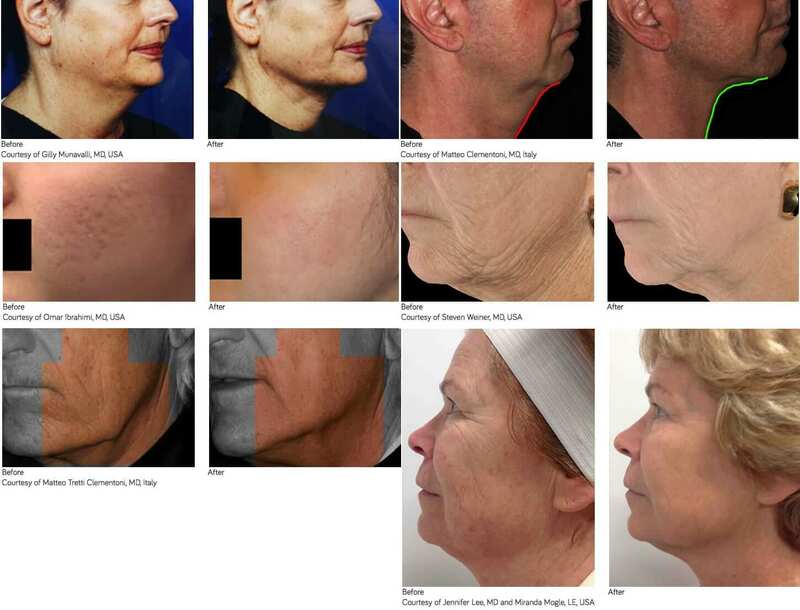 If you are considering a non-surgerical facelift using the Infini laser, schedule your consultation with Dr. Wald today. Contact our office at (714) 312-3549, or fill out our online contact form here for additional information. This entry was posted on Friday, March 4th, 2016 at 8:08 pm	and is filed under Acne Treatments, Facelifts, Infini Laser, Laser Skin Resurfacing, Non-Surgical Procedures, Skin Care, Wrinkle Reduction. Acne is a condition that can arise when there’s an overabundance of bacteria and oil on the skin. Normal oil amounts keep skin healthy, and when hormones are properly balanced, estrogens and androgens work to keep the skin moisturized. However, hormonal imbalances can cause the sebaceous glands on the skin to overproduce oil. This excess oil, combined with anaerobic bacteria, can lead to acne. In many cases, acne is painful, difficult to treat, and can leave permanent scars, but with modern technology, acne and acne scars can be treated with great success. Dr. Robert Wald at The Aesthetic Institute utilizes the Sciton® Laser to effectively treat acne in many patients, improving not only their condition but also the quality of their skin and the appearance of acne scars. The Sciton® Laser transfers heat directly through the skin and penetrates deep into the dermal layer. Precision cooling technology protects the surface skin from damage during the process. The heat waves kill bacteria and increase collagen production and skin contraction. Some of the conditions this treatment can improve are facial wrinkles, sun spots, pigmentation problems, acne scars, and active acne. The treatment is only 15 to 30 minutes long, and patients experience minimal pain, little or no recovery period, and no downtime. While other treatments may fail to treat resistant active acne, the Sciton® Laser has been shown to be effective in reducing acne in all skin types and tones. As the Sciton® Laser penetrates the skin, it kills bacteria and shrinks the sebaceous glands so that they are less likely to overproduce oil. It also stimulates the growth of collagen, which repairs and heals the skin. These processes work together to repair acne-damaged skin and to reduce the likelihood of future acne. Dr. Wald can use the Sciton® Laser on the face, neck, chest, back, and arms to treat acne. It is more effective and safer than common CO₂ lasers because it treats all skin types, allows Dr. Wald excellent precision control, increases patient comfort, improves recovery time, and adapts easily to new procedures and treatments. Using this evolving technology, Dr. Wald can always provide his patients with the newest developments available for the Sciton® Laser. Even though acne affects almost everyone, it shouldn’t have to be a burden or leave you with permanent reminders in the form of scars. Dr. Robert Wald is a board-certified plastic surgeon who can treat your active acne or acne scars with Sciton® Laser technology. Call (714) 312-3549 or fill out our online contact form to schedule your consultation with him today. This entry was posted on Wednesday, May 13th, 2015 at 6:40 pm	and is filed under Acne Treatments, Laser Skin Resurfacing, Sciton® Laser.